What is Managed IT and Do Small Businesses Need This Service? The last 20 years have been great for large enterprises around the world with various technological solutions aiming to improve productivity and efficiency for the big businesses. Things have changed quite a bit in recent years, and one of the biggest changes has been the introduction of managed IT services. These modern technological advancements are favoring small businesses. Managed IT services aim to take the burden of managing IT from a business to the service provider. They are known as MSPs, and these companies have professionals, equipment, and the technology to support almost any type IT operation of a company from within the company or remotely. There is no specific definition of what managed IT services must include. These services can be as simple as providing troubleshooting support in the case of commonly occurring computer related problems, and as complex as preparing the entire IT infrastructure within an organization for the implementation of a new CRM or ERP system. Can Small Businesses Benefit from Managed IT Services? A more suitable question will be: “can large businesses benefit from managed IT services?” It is clear that such services hold lots of benefits for small and medium-sized companies, and an example of this is cost-efficiency. Do not let the thought of being a small business trick you into thinking that you are safe. Hiring an entire IT department, managing an IT infrastructure and keeping up with the changes in these technologies can break the back of a small company. Here is how small and medium-sized companies can benefit from managed IT services. A small business can either grow by directly increasing its profits or cutting its costs. Managing a full-fledged IT department can be extremely costly for businesses that are still in their early stages of growth. A more appealing solution is to pay a monthly fee to a team of professionals and let them manage everything. Small companies cannot pay large compensations to their IT employees. Paying less means they are not able to attract the best of talent to work for them. As a result, the IT department of the company performs well below its optimum performance levels. One of the biggest threats to any business that depends on IT is cyber attacks. A cyber attack that successfully achieves its goal will cost a business around $5 million. Surveys have also revealed that most organizations do not believe in their current measures against cyber attacks with 69% not trusting the existing antivirus solutions to prevent internet attacks. Small businesses can secure their systems affordably through managed IT services. Compliance with recent security-related regulations around the world is critical for any business today. Non-compliance with regulations and standards like HIPAA, PCI DSS, GDPR, etc. can result in heavy fines and even business shutdowns. Managed IT service providers are the best people to keep your systems, policies, and methods in check and compliance with regulations. It won’t be wrong to say that managed IT services are more beneficial for small businesses than they are for large enterprises. 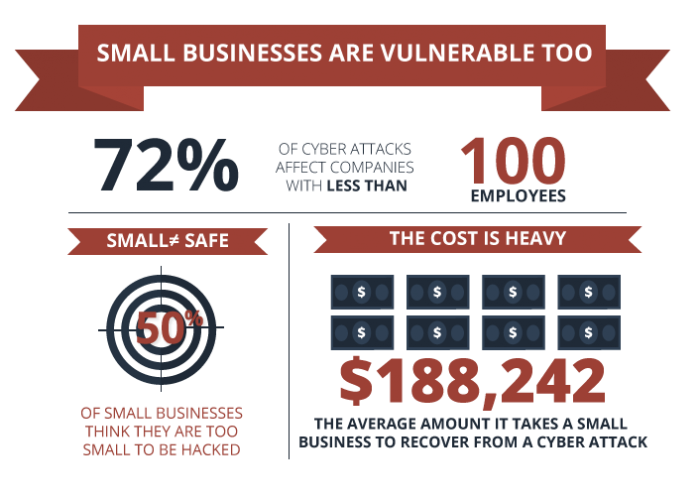 Any small business owner in the world must not be under the impression that their small size will save them from non-compliance penalties and protect them from cyber attacks. If your only reason for not implementing a powerful IT infrastructure at your company is high cost, then now is the right time to make a move and benefit from managed IT services.